Thames & Kosmos was presenting a variety of new titles at New York Toy Fair scheduled to release this year, including its new Adventure Games line, the Ubongo! 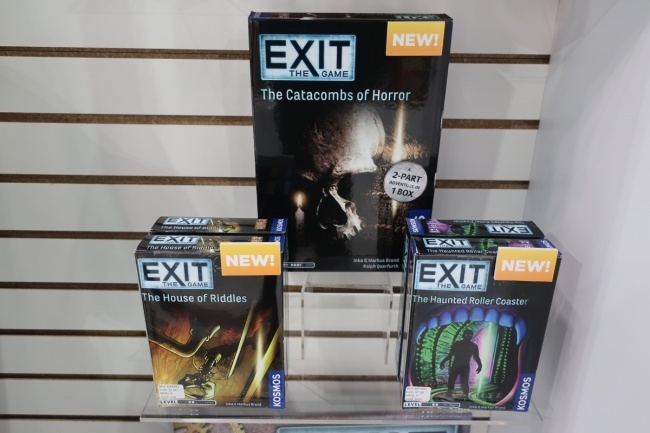 Extreme Fun-size Edition, an updated version of Lost Cities: The Board Game, Imhotep: The Duel, Tribes, Roll For Adventure, three new Exit titles, and the new Brainwaves line. 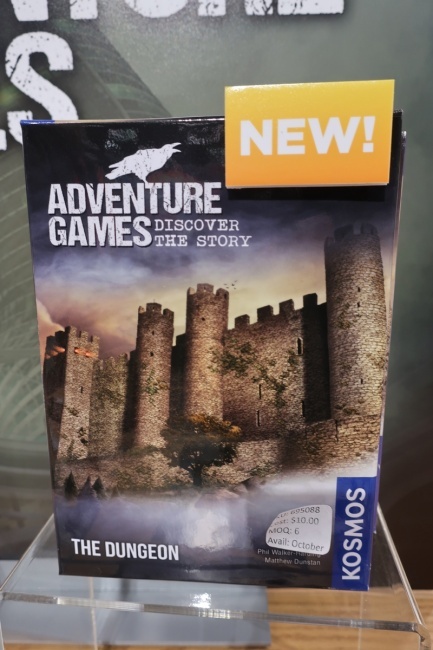 Click on the gallery below for images of the new Thames & Kosmos games on display at Toy Fair. The first two games in the series, The Dungeon and Monochrome, Inc. will release in October. Each game comes with three separate “chapters” in the box for players to explore. 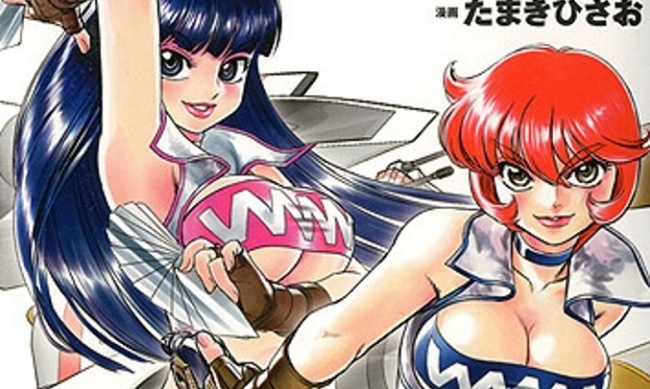 Each chapter takes about 75 minutes to play. MSRP is $19.95 each. The Ubongo! 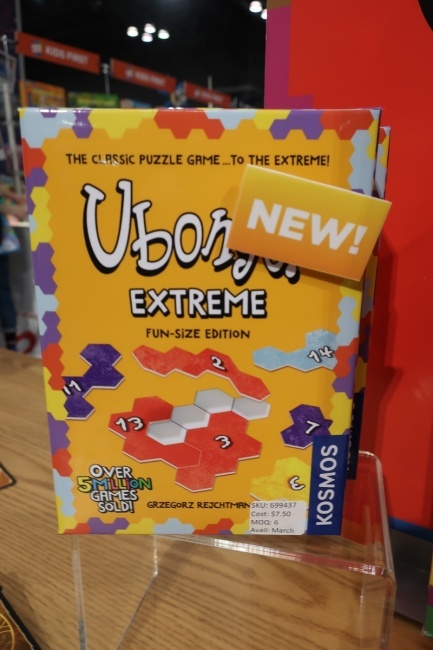 Extreme Fun-size Edition is a portable version of the puzzle game featuring more complex hex-based pieces, a follow-up to last years’ Ubongo! Fun-size Edition. MSRP is $14.99, and release is set for March. 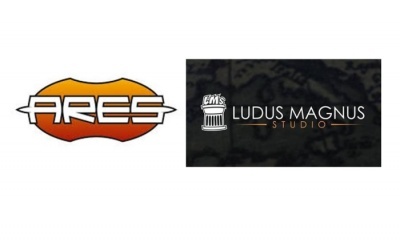 Following last year’s refresh of the Reiner Knizia card game classic Lost Cities (see “Thames & Kosmos Reveals Three Titles”), the board game version gets a refresh of its own. There are no changes to the game mechanics, but the artwork has been updated. MSRP is $19.95. 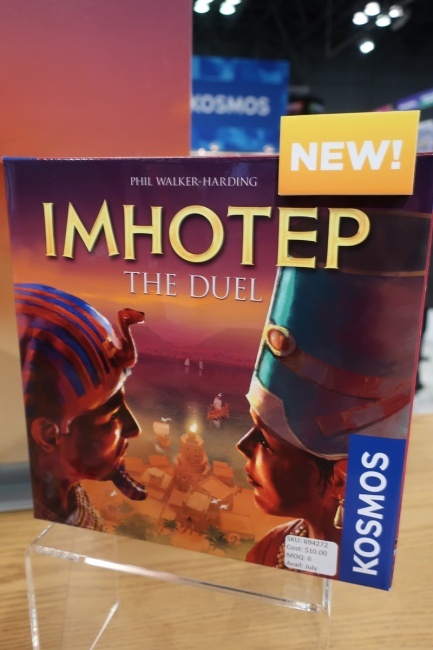 Imhotep: The Duel transports the theme of the 2016 game into a two-player head-to-head version with new mechanics. Players still gather resources and use them to build monuments, but the game system for acquiring those resources has changed. Gameplay is around 20 minutes. MSRP is $19.95, and the game will release in July. Rustan Hakansson’s (Nations) new design, Tribes, will release in July. 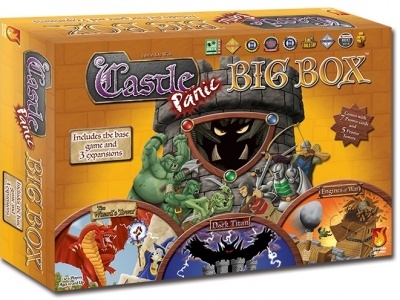 This game offers a streamlined civilization-building experience similar to his earlier game, and is designed to play in under an hour with 2 to 4 players, ages 10 and up. MSRP is $49.95. 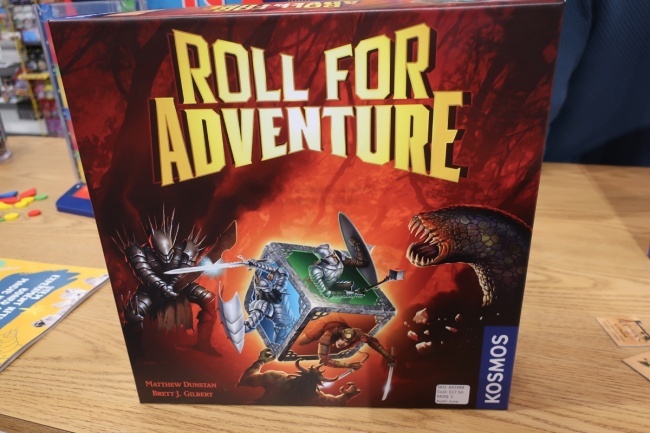 Roll For Adventure is a cooperative dice game that plays in about half an hour with 2 to 4 players. The players work together to protect four realms from the ravages of the “dark lord,” using the dice to trigger their characters’ special abilities. 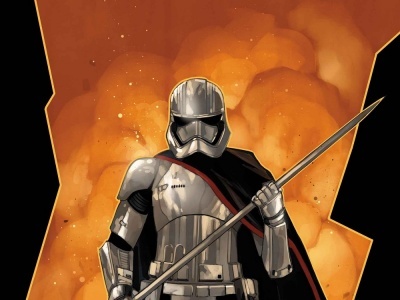 If they can overcome the dark lord’s minions and complete four of the main objectives, they win. Release is set for June or July, and MSRP is $34.95. The first two titles, The Catacombs of Horror and The House of Riddles are both planned for July. The Catacombs of Horror will be a first for the line, as this larger-sized version will feature a two-part adventure and an extended playing time. The MSRP for the The Catacombs of Horror will be higher than other titles in the series, coming in at $24.95. The third Exit game for the year will be The Haunted Roller Coaster, releasing in September. Thames & Kosmos will also be offering floor-stand and countertop displays for the Exit line. 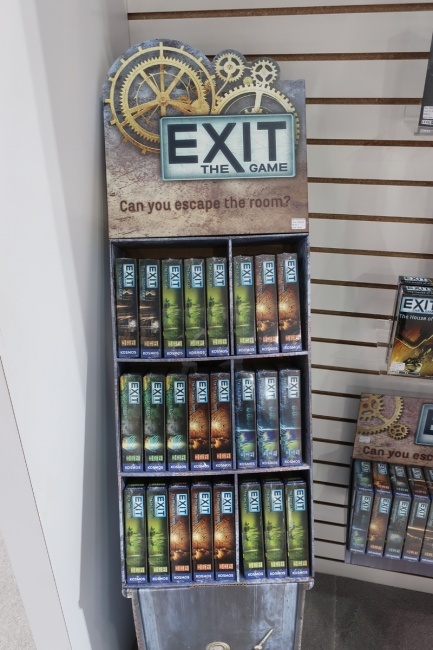 The displays will include a variety of currently-available Exit titles, including newer titles as they are released. The larger-sized Catacombs of Horror will not be included in the assortments. 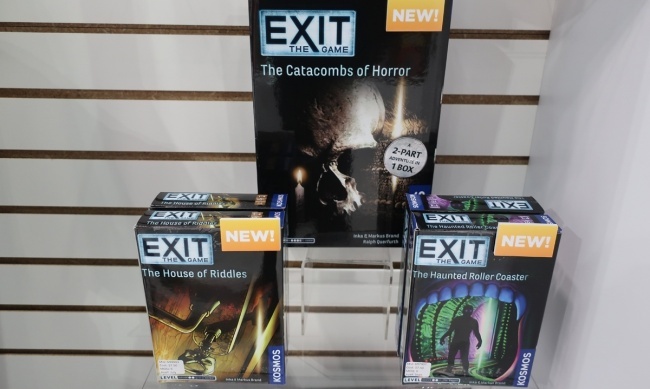 The most recent releases in the line were The Sinister Mansion and The Mysterious Museum (see “Thames & Kosmos Unlocks Two New ‘Exit’ Titles”). Astute Goose combines classic memory-games with a dice mechanic. After players observe the assortment of “suspects,” they roll the dice to determine which attributes they have to locate on the cards. In Wise Whale, another memory-style game, players are not simply trying to match identical cards, but instead must match attributes, such as a color or animal on those cards, again determined by a dice roll. Rounding out the trio is Brilliant Boar, in which each player is dealt a hand of cards that they memorize before placing them face down. Then they must try to match their hand cards with cards from the tableau. 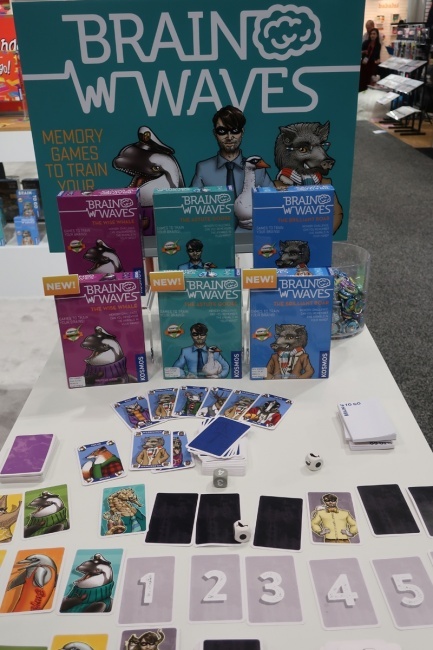 All three Brainwaves games will be MSRP $14.99.